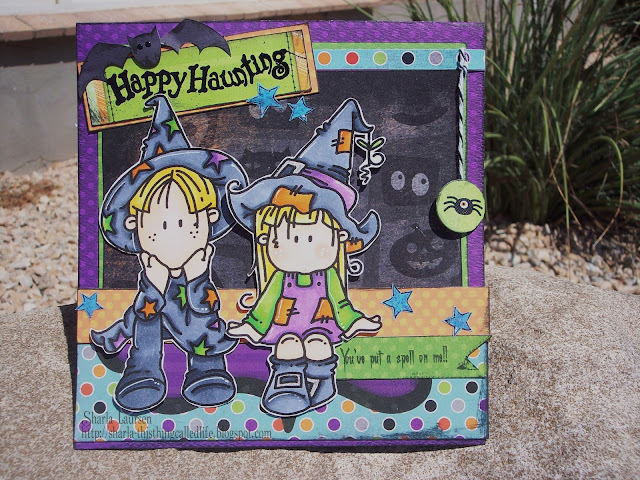 Card Cupids is up with another challenge that is being sponsored by Bugaboo Stamps. Our theme is Halloween. I used these adorable images for my card. Brat Witch and Wizard . I sat them next to each other and popped the witch up a little bit. I used scrap paper and the Whoo-ligans collection from Bo Bunny. I cut the bat out of pattern paper, stamped and embossed the Happy Haunting, colored with copics, cut the stars out of paper and put stickles on them. Added the sentiment and the spider sticker attached with black and white twine. I think this turned out super cute and my daughter wants to send this to her "boyfriend" who is back in Rhode Island at the Naval Academy, I thought the sentiment was cute and as soon as Ash saw it, she pretty much snagged it up so she could send it along with a care package to her friend. We would love for you to join us over at Card Cupids for our challenge and if you feel so inclined, to also send in some handmade cards to give to children that need some happy mail. Please check out Card Cupids for the details! It's just tooo cute! I saw it over on 'Crazy' and have to come and have a peek! How sweet, Sharla! Love the bat and little stars!